In 1973 KC’s young travel reporter set off to discover our SE Asian neighbours, for a year or so. Travelling slowly through Bali, Java, Sulawesi, Kalimantan, Sabah, Sarawak, Brunei, West Malaysia and Thailand, I eventually arrived in Vientiane, capital of Laos. It was strangely quiet, despite the Vietnam War raging not far off, with communist Pathet Lao troops already encircling and preparing to oust the Royalist government. Blithely taking a bus north to the old Royal seat of Luang Prabang, I was turned back by a roadblock not far out of town. A highlight of my Vientiane stay was the infamous White Rose night club, where floor shows were as salacious as the best (or worst!) of Bangkok’s notorious Pat Pong Road bars. Other customers included dodgy CIA and Air America operatives, infamous for flying arms and drugs to/from tribal groups fighting the communists. Not exactly Apocalypse Now, but a curious ambience nonetheless in that sleepy town on the Mekong. My spirit of adventure undoubtedly had a good dose of uninformed nonchalance and naivety. Eighteen months later the communists completed their takeover of the country and Vientiane was quickly reformed of its bad habits, including a ban on prostitution and closing down the seedy bar scene. A severe form of regimented Lao-style communism was installed. Recently I read the first in a series of crime thrillers set in this period: ‘The Coroner’s Lunch – A Dr Siri Paiboun mystery set in Laos’ by Colin Cotterill. Engaging and simply told, it portrays this mix of communism and old Lao customs, as guerrilla cadres out from their jungle hideaways take control. Official stupidity, surveillance and corruption abound, making life difficult for Laos’s only coroner. But our 70+yr old hero carries out his investigations with aplomb and murder mysteries are resolved in the Lao way. When lunching with a politburo pal, overlooking the Mekong, Dr Paiboun occasionally washes it down with illicit Lao-Lao, the local rice whisky. It’s not high literature, but the story is insightful and evocative of that time and place. 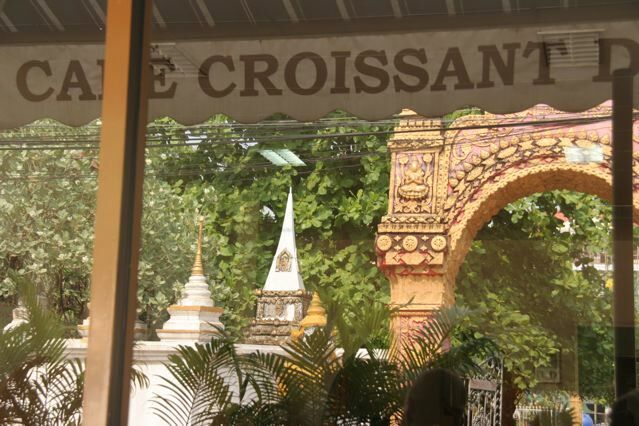 My own Lao story came full circle two years ago, returning there thirty-six years later. The White Rose is long gone, but its ghost remained in the restaurants around Nam Phou fountain. 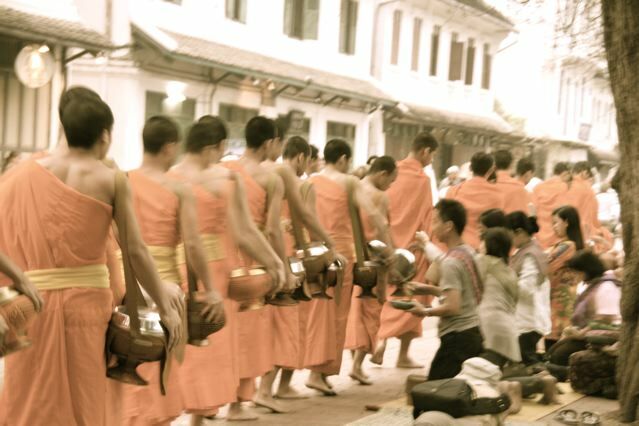 Prostitution is still illegal in Laos and the low bar scene has not been allowed to return. In 1973 I had to fly over Pathet Lao territory to reach Luang Prabang, and this time I travelled by bus, over two days through spectacular rugged mountains. LP is now UNESCO heritage-listed because of its unique architecture of royal palaces, Buddhist temples and French colonial buildings, nestled in the junction of two rivers. The restorations work well, and it’s still a cool place to hang out. Sundowners are de rigueur and Beer Lao in large bottles is my palliative for the tropical heat. 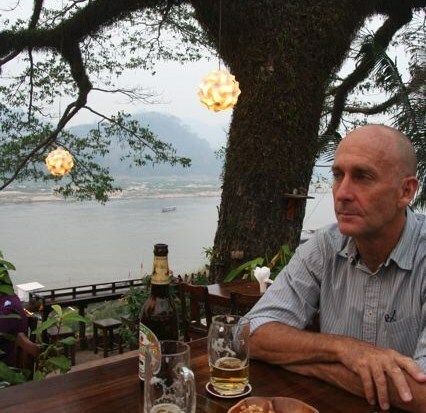 Enjoying them on a cafe terrace overlooking the Mekong (far north of Dr Paiboun’s favourite spot) was a nostalgic treat – surrounded by my old Laos and distant memories. Q: “Bo penh nyang” – no problem! A: “Thammadha” – she’ll be right!